You don’t really expect a die-hard cake lover mom and son to miss making a Christmas cake, do you? Trust me, we don’t miss a reason to bake a cake. Christmas is certainly a big reason to make a delicious Christmas cake. A Christmas cake is a rich fruit cake covered with marzipan and icing, eaten at Christmas. Traditionally, the English people used to fast a day before Christmas evening. The very next day they used to prepare and plum porridge to line their stomachs after a day of fasting. 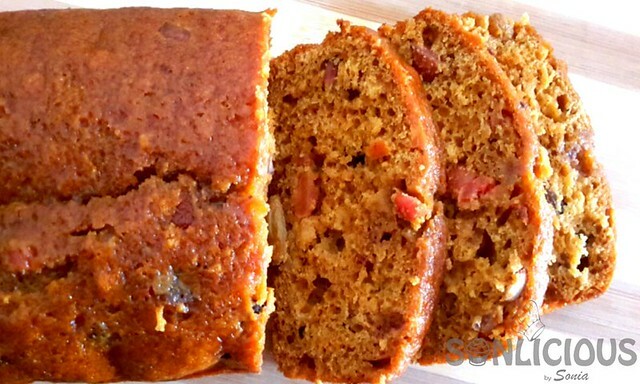 The plum porridge cake is the traditional Christmas cake recipe. Ever since the human race has existed, they have always experimented and furthered the available. So happened with the Xmas cake recipe. 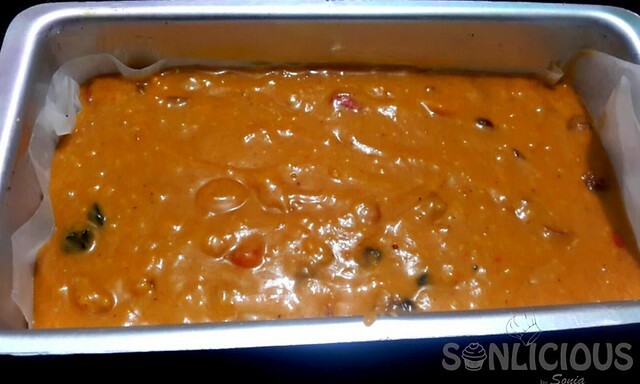 The addition of spices and dried fruits in the plum porridge converted the porridge into a pudding. Gradually alcohol became a part of the Christmas Desserts, a sign or richness. These cakes were made in advance, almost two months in advance. Brandy, Whisky, and Rum were poured in the cakes from time to time until Christmas. The process is called “feeding” the cake. This feeding process helps to mature the cake. This Christmas season, I thought to bake my own Christmas cake rather than buying it from the market. Since I was baking it for my family so I was looking for a Non-alcoholic Christmas Cake recipe without eggs that everyone in the family could enjoy. After reading a lot of Christmas cake ideas, I finally replaced the alcohol with fresh orange juice. Soaked the chopped nuts in fresh orange juice and honey for a good 2 months. Don’t have time to soak nuts for 2 months? Hang in with me and I will share a magical tip with you. The experiment was successful. People went crazy to know that we can soak nut in fresh orange juice. 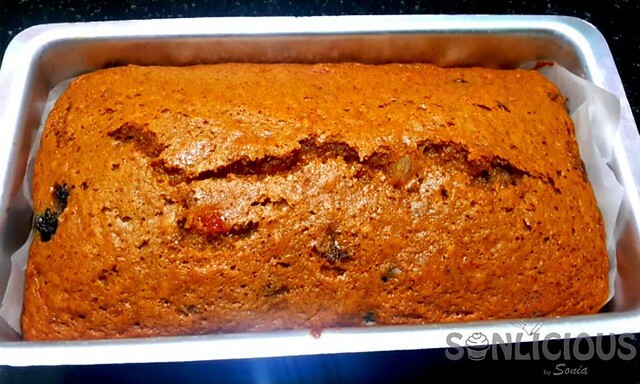 The recipe turned out to be super delicious and best ever non-alcoholic Christmas cake recipe. 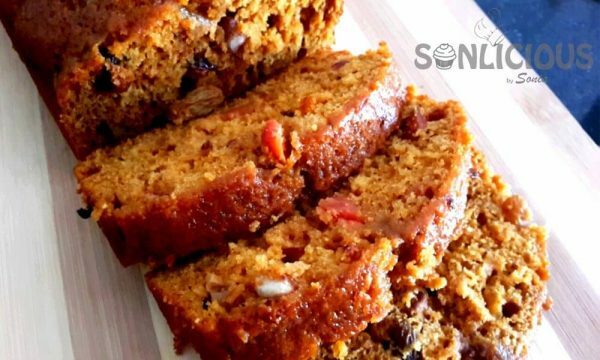 For folks, who would have missed soaking nuts for 2 months and want to make the cake instantly, they may boil the nuts in a mixture of honey and fresh orange juice till the juice reduces to half. Do not worry, the cake will still delight everyone. Finely chop all the nuts and berries. Mix them with honey and fresh orange juice. Take a glass jar and put the mixture into it. Make sure that all the nuts and berries are soaked well in juice. Tip 1: Use only fresh orange juice. No preservatives required. Tip 2: Want to soak nuts for longer? Close the lid, keep the bottle in the refrigerator, it’s that simple. PS: I soaked Nuts and berries for 2 months. Heat a non-stick pan and add sugar to it. Keep the pan on low flame. Let the sugar melt. Switch off the flame and add fresh cream and mix it well. Now keep it again on a medium flame and add butter to it. Stir it for 2-3 minutes. Switch off the flame and let it cool down. In a large bowl, take the caramel sauce. Add oil, soaked nuts and berries and mix. In a separate bowl, sift all the dry ingredients (Flour, Spices, Baking powder and Baking soda). Mix all the dry ingredients with wet ingredients and make a smooth batter. Don’t over mix the batter. Pour this batter into a greased baking tin and tap it once. I am using a baking tin of 8x4x2. Meanwhile, preheat the oven to 180 °C. Now bake this batter at the same temperature for about 30 minutes or till it passes the toothpick test. Once done, take the pan out of the oven and let it cool completely. 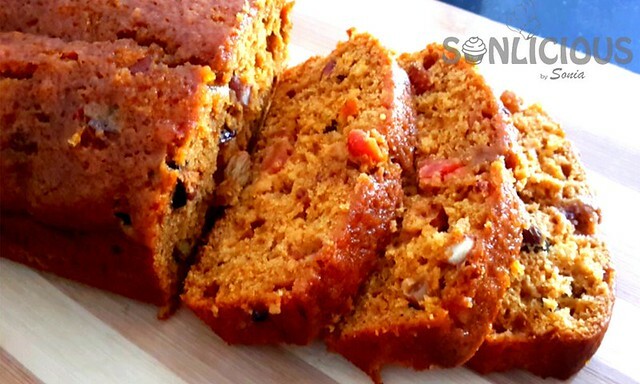 Learn how to make Christmas Cake with nuts and fresh orange juice. This Christmas fruit cake recipe is a non-alcoholic simple Christmas cake recipe. 1.5 cups Nuts and Raisins Glazed Cherries, Tutti Fruity, Almonds, Cashew nuts, Black Berries etc. Finely chop all the nuts and berries. Mix with honey and fresh orange juice. Take a glass jar and put the mixture into it. 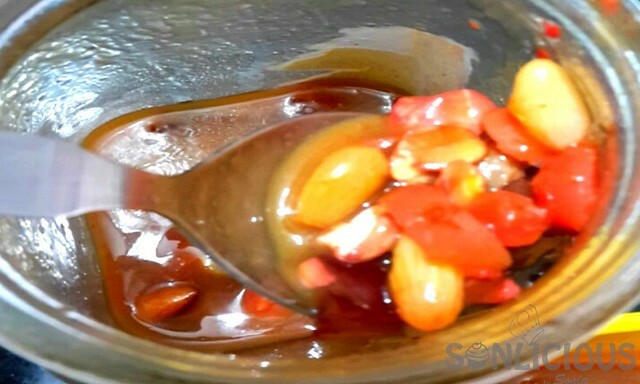 Make sure that all the nuts and berries are soaked well in juice. Cover it with lid and keep it in the refrigerator if you want to soak for a longer time. I soaked Nuts and berries for 2 months. 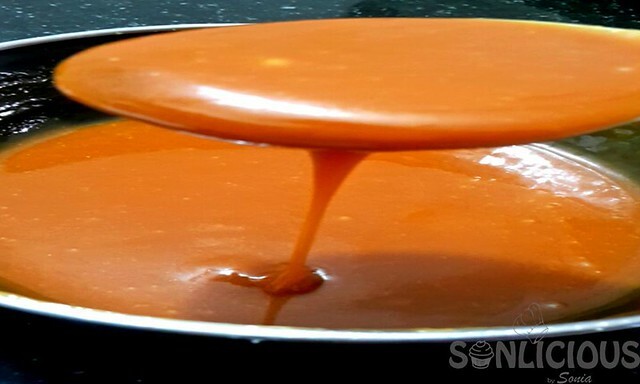 For Caramel sauce, Heat a non-stick pan. Add sugar to it and keep the pan on low to medium flame. Let the sugar dissolve. Once the sugar dissolves, switch off the flame and add fresh cream to it and stir well. Mix it properly. Now keep it again on medium flame and add butter to it and stir it for 2-3 minutes. Switch off the flame and let it cool down. In a large bowl, take caramel sauce. Add oil, soaked nuts and berries and mix. In a separate bowl, Sift all the dry ingredients (Flour, Spices, Baking powder and Baking soda). Mix all the dry ingredients with wet ingredients and make a smooth batter. Don’t over mix the batter. 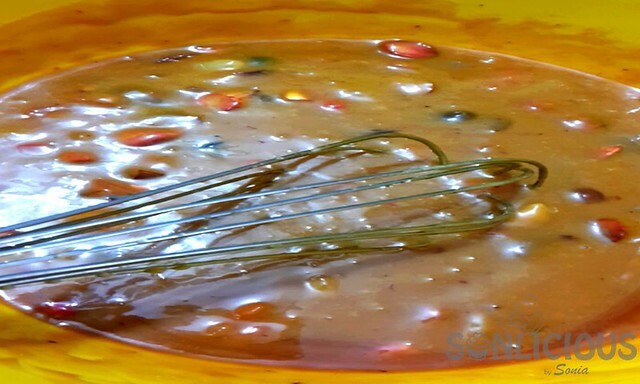 Pour this batter into a greased baking tin and tap it once. Meanwhile, Preheat the oven at 180 °C. Now bake this batter at the same temperature for about 30 minutes or till a toothpick inserted into the centre comes out clean. Once done, take the pan out of the oven and let it cool completely. Slice and serve it. I have tried many recipes of urs. I should say that this s thé best cake i have ever made. Thanks a ton… I’m super excited with thé results.. 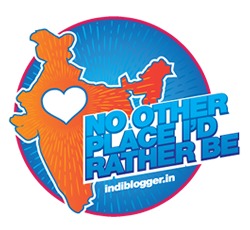 Thanks much for such a lovely comment. The cake shall stay good for 4-5 days at room temperature. I have used 8x3x2 inches pan size. No sugar other than caramel?? Manual whisking or Electric beater for mixing the ingredients ? Geethu I prefer to use a manual whisk. However, you can use electric whisker as well. Tried the christmas eggless plum.cake. It is delicious and yummy. The texture is very very soft. While i cut the piece its just falling apart,is it the way they should be. Anything wrong that its not staying as a piece..
Reshmi, use a sharp knife to slice and let your cake rest properly before slicing. This will help you to get clean slices. Tried tje christmas eggless plum.cake. Reshmi, use a sharp knife to slice and let your cake cool down properly before slicing. If I want yo soak the fruit for 2 months or less, can I keep it out? Will the orange juice turn bad? You can soak and keep that jar in the refrigerator up to three months. I don’t make cream at home. It rely on Amul fresh cream. Any substitute for fresh cream? Can I use cooking cream? I have used Amul fresh cream. I am not sure what you meant by Cooking Cream. Thanks for the amazing Christmas cake….